Long before food tech became a catchword, Sandipan Mitra, Co-founder and CEO of HungerBox, a business-to-business (B2B) food tech start-up, started an online food ordering company in 2007 and named it HungryBangalore.com. It was just like Zomato and Swiggy are today. But he and his co-founder never thought of life beyond Bangalore. When Indian Angel Network (IAN) came on board with its investment, they advised Mitra to change the brand name to HungryZone.com. The business continued for a couple of years before UK-based Just Eat group set its sight on this start-up to enter the Indian market. After a few negotiations, the deal was closed but Mitra continued to work with Just Eat India. Food tech industry was still in infancy, and Mitra travelled extensively across Europe to understand how the food tech industry was evolving in other markets. Just Eat was present in 26 cities, including Delhi, Mumbai and Bangalore, and was directly competing with Zomato. “We had a war with Zomato. They were doing listings. Zomato used to say that nobody orders food in India. We used to say that online food ordering is the future. Today, Zomato has survived because of online food ordering,” says Mitra. Around 2012, the smartphone market began to explode, and that completely changed the food tech sector. Mitra recalls that he started 2013 with 100 per cent orders coming from the web, and by the time the year ended, 50 per cent orders shifted to apps. “That was a pivotal year for all of us,” he says. Sensing the huge opportunity in the Indian market, Foodpanda approached Just Eat India with a proposal to acquire them. In April 2015, they bought over Just Eat India in an all-cash transaction. After selling the business to Foodpanda, Mitra stayed with the company for some nine months heading its B2B segment, a fairly underrated and relatively low-visibility area within the food tech space. He met a plenty of large companies to understand the need of food tech in this space. “The B2B foodtech has not changed for the past 30-40 years. Gone are the days when people used to have cafeteria food once a day. Today, you have minimum twice a day,” he says. Mitra realized that B2B food tech is different from B2C (business-to-consumer) segment, and his offering has to be completely customizable and scalable. With that learning, he quit Foodpanda to start his own venture HungerBox. In September 2016, HungerBox claims to have launched India’s first 100 per cent digitalised cafeteria with a client called FirstSource. How does it work? In India, cafeterias in corporate campuses are highly inefficient. HungerBox, which is promoted by K. Ganesh’s GrowthStory, began pitching the idea of digitalising cafeterias at various large companies. The first few months were difficult. The detractors pointed out the nexus between the junior administration staff and food vendor that could possibly kill the business. There was a backlash from vendors because it was talking about bringing in transparency and processes. 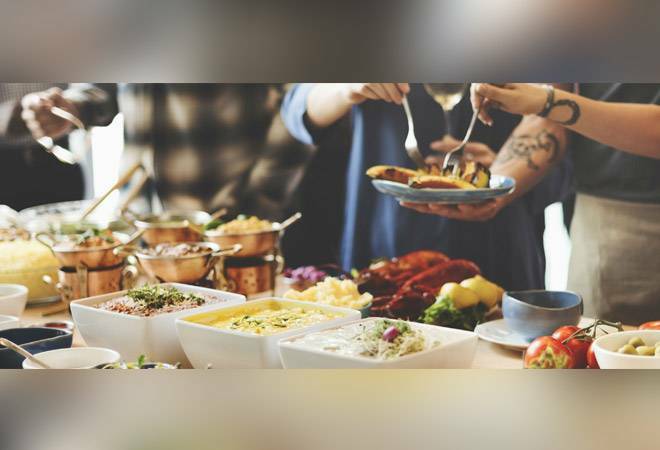 “We approach CXOs and explained to them that F&B (food and beverages) is the second-most important service provided by employers – after transport. We told the companies that they have to bite the bullet,” says Mitra. The first step was to launch company-specific apps that allow employees to book their food (at the office cafeteria) online. People use apps for everything – booking for cabs, movies, bus ticket and other things. The benefit of online is to save the amount of time that otherwise gets wasted in ordering food offline. Each app is loaded with features. It displays menus of each vendor (each office typically has a bunch of vendors). There’s an option of food preferences (right at the top of the user interface) that’s curated for each employee based on their order history. Based on aggregated data, vendors are also informed about the preferred food menus. Since the menu changes every day, HungerBox has a call centre team – that can speak in nine languages – that picks up the menu from each vendor. The app shows the waiting time at each vendor, and employees are asked to rate vendors which, in turn, compel vendors to duke it out with each other to improve their ratings. And last but not the least, the app supports payments from 51 banks, major commercial wallets and meal cards (like Sodexo). “There’s something called pay later feature wherein employees can clear their dues twice a month. That’s largely mimicking the offline habit of eat-now-pay-later,” Mitra says. In about 22 months of its existence, HungerBox has bagged 69 corporate clients including Qualcomm, Microsoft, Accenture, CapGemini, Genpact, ABB, Amazon and McKinsey in nine cities. It works with 564 partner vendors, and manages 165 cafeterias in nine cities churning out close to 2 lakh transactions a day. The company charges commissions from vendors – about 10 per cent on the overall food sales – and claims to be operationally profitable. While doing his graduation, Mitra worked as a part-time waiter at a fast food outlet in Bangalore. Today, he’s leading a start-up that has a revenue run-rate of about Rs 180 crore. “My dad still calls me bawarchi,” he quips. For him, life seems to have come full circle.